It’s been over a month since Microsoft launched Windows 10 and if you missed the initial push – well done, where have you been? But, now you’re back on Earth, how do you get Windows 10 installed? You have three choices: upgrade, buy a new computer, buy a retail copy. Microsoft has slimmed down the number of SKU’s (product versions), and in an attempt to force through the adoption of Windows 7, has already upgraded over a 100 million machines for free or at a discount. 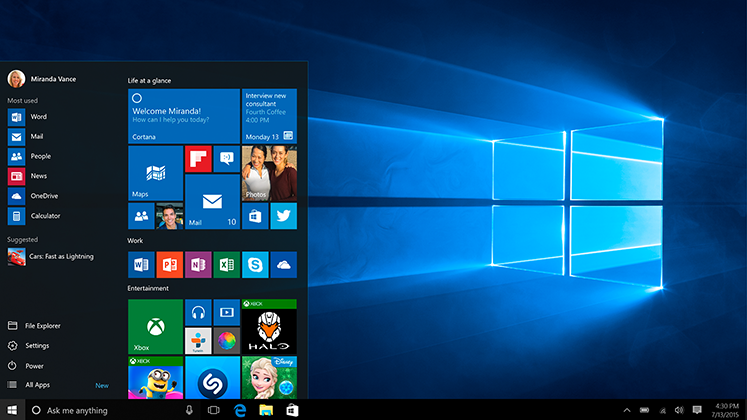 Windows 10 is available for free for existing users of Windows 7 or Windows 8.1 on a PC or tablet. As long as it’s a genuine licensed copy able to dial home via Windows Update, you will get a little white Windows logo by way of a notification in your taskbar; this tells you that the upgrade is ready to download and install. also be aware it has to be Windows 8.1 – the original Windows 8 won’t upgrade. That’s Microsoft acknowledging how bad Windows 8 is as a platform for anything. Before you do that, take a full back up of all your files. Even though this is the most tested version of Windows and should be compatible with most of the hardware on the planet, that’s not a guarantee. Failures are relatively rare in the 100 million or so upgrades to date; just don’t be the one in a million whose machine completely foxes the Windows 10 installer and keels over. Brand new PC, laptops, and tablets running Windows are now shipping with 10; those still on 7 or 8.1 will be eligible for an immediate free upgrade (see above). If you don’t qualify for a free upgrade, run Microsoft’s compatibility checker to find out if your device supports it. If so, you can get a boxed retail copy or a download version with a license key and upgrade yourself. The Windows 10 Home System Builder version is under £60, Windows 10 Pro version is £65.